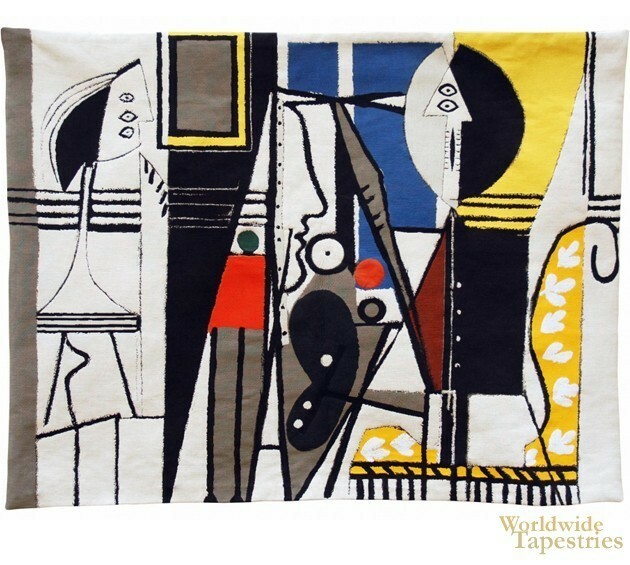 This art tapestry "Cubism" is inspired by the art of Picasso. Called Le Peintre Et Son Modele, or The Painter And His Mode, it was originally painted in 1928 and is considered one of Picasso's greatest works. The original is now exhibited at The Museum of Modern Art in New York. Here in this modern tapestry, we see a piece showing the human form in deconstructed and cubist theme, made so popular by Picasso. He typically takes the human form and creates art from its abstraction. This modern piece shows the style of Cubist art and is totally unique and distinctive. This large art tapestry "Cubism" is backed with a lining and has a rod pocket for easy hanging. Dimensions: W 56" x H 43"